The history of modern jet powered aircraft starts in Germany in 1939, when the Heinkel He 178 became the first true jet aircraft to fly. Earlier jet-like aircraft, such as the Italian Campini Caproni (used a piston engine to drive a turbine blade) and the amazing airplane built by Henry Coanda in 1910 did not have true jet engines. It's interesting to speculate what path aviation would have taken had Coanda's plane not crashed during an accidental takeoff. The Germans designed a staggering number of jet powered aircraft between 1939 and 1945; several were built and most of those flew at least once. Many of the designs were little more than scribbles, often in an attempt to keep the engineers employed and away from the front lines. Although most of these designs stayed on paper, they influenced or were the basis of many postwar Russian and US jet designs. The old version of this Web page had some aircraft pictures and text, but I never got around to completing all the entries. Since then, several related - and better - sites have appeared. Some of these pages are linked below. I've also included a Reference section, with some the books on German WWII jets, rockets and other aircraft. I used to run a small mailing list for the discussion of German WWII jets and other advanced aircraft designs. Several list members (including me!) 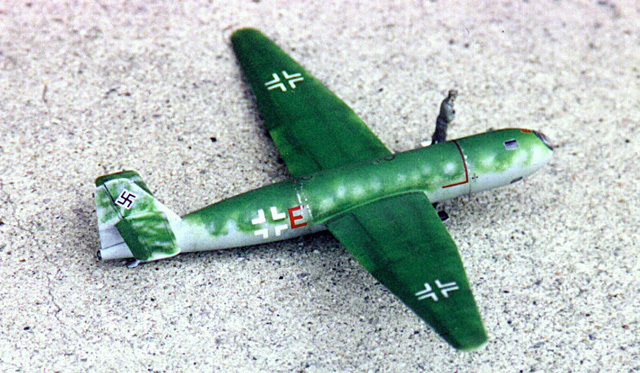 contributed model pictures to Secret Aircraft Designs of the Third Reich by David Myhra. This page in no way glorifies or approves of the crimes and actions of the Germans and the Nazi Party during WWII. Ray's Home Page Ray has his own air to air X-4 missile! Luftwaffe Resource Page which is part of the Warbirds Resource Group. Click on the pictures below to see a larger version. Click on the plane's name to go to its description on Dan Johnson's Luft46 page. 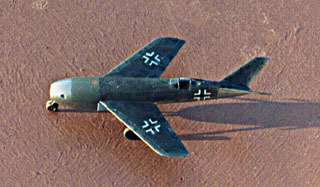 Arado Ar.E555 1/72 scale Revell-Germany. This was a fun kit to build. It went together well, with none of the fit problems I'd expected in a kit this big. The detailing is outstanding. Getting the plane to sit level was fairly difficult. I could only get it to sit level by filling up the front 1/3 of the bomb bay with Plasticene and lead shot - even though I'd filled the wing's leading edge with Plasticene. It was only later that I realized that the main gear bogie angles are critical in getting the plane to balance. Oh well - it gave me an opportunity to add two Hs293s and a Fritz X glide bomb from one of the Condor German Missile sets. I couldn't find a design that exactly matches this kit, so I decided to build it as a long range maritime attacker. The camo pattern is RLM76 overall, with large RLM75 splotches. The engine pods are RLM75, RLM74 and aluminum. I did some minor detailing in the cockpit, and added a D/F antenna on the engine pod. It looks like the Fritz X is dragging on the ground, but there's actually a few mm of clearance. B&V P.211 1/72 scale Special Hobby. My first Special Hobby kit. It took some time to clean up the flash, and sand off the various bumps and lumps from the mating surfaces. I made a detailed cockpit and detailed the engine compartment. There are no wing attachment points, so I made some by drilling a hole in the fuselage and matching holes in the wings. I then inserted a brass tube to hold the wings in place. I did the same for the elevators, but used a smaller plastic sprue. Before painting, I sprayed the plane with Gunze Sangyo's Mr. Surfacer 1000. This provided a smooth surface for the paint, and sealed any small cracks and scratches in the plastic. The engine section is Testors aluminum and steel, with some heat discoloration. I added the side camo splotches with a brush. Building the DFS 228 was uneventful. After deciding to build it as a production version, I painted the cockpit area with RLM 66, installed the cockpit windows, painted their exteriors with a liquid masking agent and proceeded with the kit's assembly. I painted the whole model with ModelMaster non-buffing aluminum followed by Testors Acryl RLM 76 overall, then painted the upper sides in a dense wavy pattern with Testors Acryl RLM 83. The wings have a very dense mottle, with a less dense pattern of RLM 83 on the fuselage sides and tailplane. I hand brushed the fabric surfaced ailerons and elevators with RLM 83, and the rudder with RLM 76. The hand painting gives these surfaces a slightly different texture. I chipped away the paint in areas that would have seen some stress - cockpit cover, engine section, etc. then painted the model with Future. 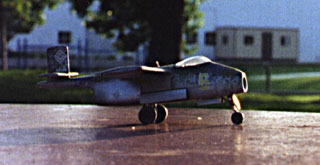 The decals came from various sources; most are leftovers from the Revell-Germany Ar 555. I didn't use the Huma decals because they're printed on a flat background that looks awful. I weathered the model slightly with pastels - this brought out the fabric effect well - then gave the model a coat of flat clear. The last step was to remove the liquid mask from the cockpit windows. BTW, the wing decals are straight! Some look skewed because of the wing dihedral and shooting angle. "Hans", the figure with a camera is from the Prieser 1/72 Luftwaffe set. Focke-Wulf 1000x1000x1000b 1/72 scale Planet resin. I've waited a long time for this kit, and even bought the all but unbuildable Unicraft kit. The FW 1000 x 1000 x1000 (or FW 1000^3) was a design to meet the specifications for a fast bomber that could travel 1000 km at 1000 km/hr while carrying a 1000 kg bomb load. Before building this kit, I drew up a fairly accurate simulation in the demo version of X-Plane I kept the dimensions and engine thrust the same and was surprised to see how well it handled - almost like a fighter. 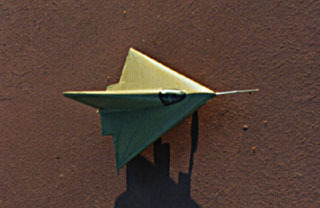 The Planet kit is fairly simple, consisting of a hollow upper and lower main wing section, solid outer wing sections and a solid nose section with the cockpit area hollowed out. they also supply landing gear doors, landing gear, a vacuformed canopy and basic interior. The original FW 1000^3 design was for a single seat aircraft. Planet supplied two seats... so I turned my model into a FW 1000^3 Nightfighter. I detailed the cockpit with an instrument panel for the pilot, a throttle quadrant and an instrument panel for the radar operator, complete with screen and hood. I wasn't looking forward to painting the extensive canopy framing, so I made a resin copy of the canopy, sanded off the frames, added new ones with tape and made a vacuform copy. I was going to add an "antler" style radar to the nose, but towards the end of the War, the Germans were already moving towards enclosed cm radar dish antennas, like those used by the Allies. I did add a rear warning antenna, and added some detail to the main gear doors. The landing gear struts came from other kits - the kit supplied resin struts look very flimsy. After painting, decaling and weathering the kit, I drilled a hole in the main gear struts and in the matching recess in the gear bay to provide better support...and accidentally drilled straight through the wing. Retouching the holes would have looked bad, so I painted some very fine plastic wire white with red stripes and glued them in the holes, to act as landing gear position indicators. 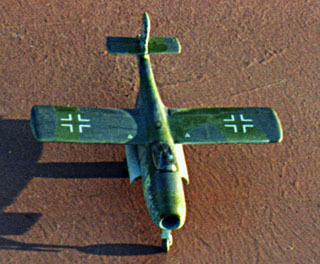 This was a common feature in the FW-190. Other additions to the kit are a photoetched D/F antenna and the otherwise incorrect gunpod from the DML Ar-234N Nightfighter kit. The plane is finished in RLM 76 uppers with a faint RLM 75 mottle (I sprayed the mottle, then added a light overspray of RLM 76), with a lightened RLM 66/RLM22 underside. 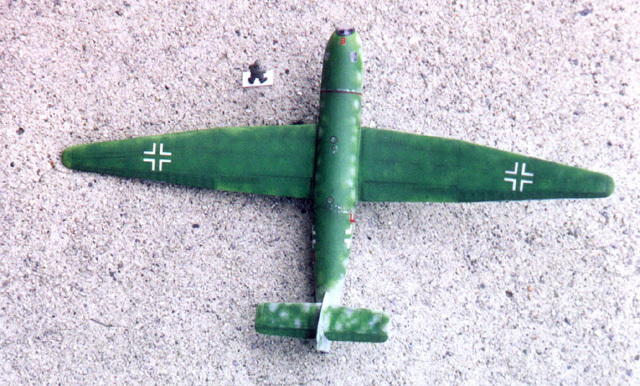 Henschel Hs 132 1/72 scale Huma. This was one of my first Huma kits. I detailed the cockpit with control horns and restraining harness for the pilot. The engine intake is a modified supercharger from an Airfix P-38 kit. I packed the nose area under the pilot, and the engine and fuselage areas forward of the main gear with modeling clay... and the model just sits level. It makes a good seismograph; any earthquake over a 3.0 causes it to sit on its tail. 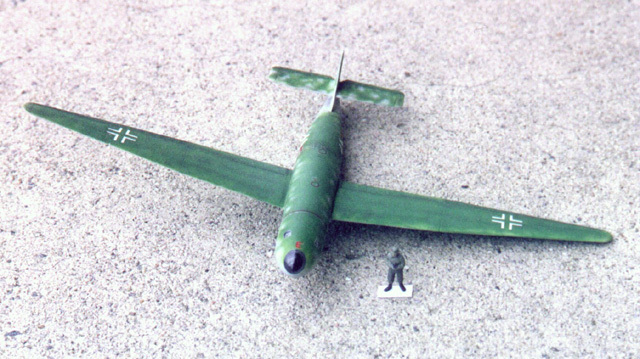 The real Hs-132 prototype looked somewhat different, but photos of the surviving prototype were unavailable until the fall of the Soviet Union; a few years after this model was produced. The prototype had a very thick glass armor plate in front of the pilot (to be expected, since this plane was designed to be a dive bomber). Lippisch DM.1 1/72 scale Huma. This is a nice kit, easy to build, with only some sanding and filling to do at the joint between the body and the vertical stabilizer. I added some details to the cockpit and landing gear and replaced the nose probe with some fine wire. Me P.1106 1/72 scale Huma. This kit was an uneventful build; I spent most of the time painting it. It doesn't show up well in the pictures, but the underside and nose are bare aluminum (Testors Metalizer), the upper sides are in RLM74 with RLM75 mottle, and a small section of the nose in RLM02. I tried to apply the mottle with an airbrush, but wasn't satisfied with the results. Instead, I applied it by brush. I softened the edges of the mottle spots by dabbing then with diluted paint. It worked well. These are some of the books that I've used to research German jets and projects. I haven't listed all the books on the subject, (for example Green's book on German Aircraft) Some of these books have errors that have propagated to other works as people use them as a reference. For example, operational Ar 234Bs never had rearward firing cannons, and there is no such thing as a "Gotha Go 229". The most comprehensive book in this collection is Die deutsche Luftrustung 1933-1945 by Heinz J. Nowarra. I got my copy (all 4 volumes) from Telebuch (now part of Amazon.com) in Germany. Phone/Fax is (757) 565-4814/(757) 253-1089. The Planes Of Fame Museum in Chino, CA. Has an excellent selection of aircraft on display, including an original Me 262, He 162 and Japanese J8M1 and a replica of the Me 163. William Caple & Co. Ltd. Die deutsche Luftrustung 1933-1945 by Heinz J. Nowarra. Kamikaze The Oka Suicide Flying Bomb, Bachem Ba 349A "Natter" and FZG-76 "Reichenberg"